The Magma Pool was introduced the 16th day of the Month of Celebrating in Y11. 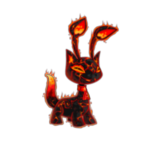 Since then many pets have gone there as this is the only place, other then the lab, to get your pet painted Magma! The Guard sleeps at a random time and it is not the same for every user. However, each individual user will be able to access the pool for the same 10-15 minute window. For example, if you can access it at 3:00pm NST, you will always be able to access it at 3:00pm NST every day, but your neofriend may not because they have their own, different time. You do not need to collect all of the Moltara Worms to make the guard sleep. There is no currently know way to push the guard into the Magma, and there will not be. 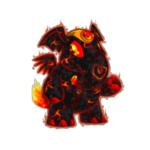 Warning: When Magma Pets are pounded their color changes to Red. You can paint pets on side accounts through the Magma Pool. 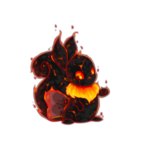 Fountain Faerie Quests will not be able to paint your pet Magma. You did not need to participate in Atlas of the Ancients to get a sleeping guard. You can only dip a pet in the Magma Pool once a week. If you return at your sleeping guard time after one week you can dip another pet. Here is some more information about the Magma Pool! The image above is what you get most of the time when the guard is not sleeping nor welcoming you in. 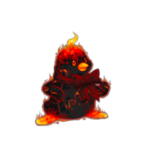 "[Neopet Name] has withstood the heat of the Magma Pool and emerged with this fiery new look!" The above image appears when the guard accepts you, there are no proven theories on how to let the guard accept you at the moment. That is the point of testing them. You might be wondering, when and how can I get a Magma pet? This nifty little section answers that. You can only get a Magma pet when the guard is sleeping. The only other way known currently to get a Magma pet is through the Secret Lab. Also for those of you who would like to see what your pet would look like before you paint it you can see it at the Rainbow Pool ! Not to mention that 54 out of 55 species are currently available in Magma shade and they all come with standard clothing, look just below to see some examples. The Snowager is awake. He'll be sleeping in 4 hours, 47 minutes.